Daniel Lange was born in Buenos Aires, Argentina in 1955. He was brought up and educated in the United States. After leaving Southern California, he went east for a college education and attended Boston University, New York University and Hunter College of the City University of New York, where he studied Political Science and Theatre. In his early twenties he moved to Paris, where he lived for a 15 year period, and was involved in Art and Fashion. He exhibited his painting, worked in Fashion and attended the Sorbonne, where he studied Theatre Arts, Set Design at the Ecole National Superieur des Arts Decoratifs. He has lived in Tuscany, Italy in a Buddhist retreat center, and has lived in a Buddhist monastery in India. He presently lives on a small farm in Cachi Adentro, a valley at the foothills of the Nevado de Cachi, Province of Salta, in the high desert of Northwestern Argentina. The birds came and went from the golden field to the branches of the great leafless willow trees bordering the irrigation ditch on that fall evening when Nora and Joaquin arrived at San Francisco del Monte. They were driven in an old Ford pick-up which was already disheveled when it came up on the dirt road from Cachi. It was the year 1962. Nora was tall and thin. She wore black sunglasses from which a pointed nose emerged. She wasn't very beautiful, and yet she was elegant. She knew how to dress soberly. Joaquin on his part was already getting on in years. He wore a cap below which one could already see his graying hair. Both appeared somewhat tired and dusty on that afternoon in which a breeze spread leaves off the ground and sent them wherever it wanted to. Nora arranged her hair with her hand and searched for her pack of cigarettes inside her purse. Joaquin stopped to admire the mountains while the chauffer came out of the vehicle too, and walked to the rear to remove the luggage from the trunk. Milagros had set the table outside for tea because it was the end of the day, and it was too early for dinner. The white tablecloth floated in the afternoon breeze and brushed against the back of the chairs. The white and blue English china glittered under the shade of the vines. Nevertheless, it was a bit late for tea when they arrived. The sun was already disappearing, and the cool evening breeze stopped us from having tea outside. I asked Milagros to set the table in my father's study where a fire was already burning. I had nothing else to do. I could sit and smoke a cigarette before my guests arrived. Un-cork a bottle of sweet red wine and help myself to a glass because I already considered my activities for the day completed. I could wait for them like this, looking out the window with a glass of wine in my hand, I thought. Although, Milagros was responsible for cleaning, I had a lot to do during the day; at least, I had to put my papers in order and write a few letters before they arrived. That's when I saw the pick-up come down the dusty lane. Nor the cacti, nor the spirits, only the quiet road and the wind no longer blowing. No, they hadn´t had children. They read the sacred texts of the Incas and of the Jesuits. They knew the Exercises by Ignatius of Loyola; Joaquin had mentioned them in a letter. Our mutual friend, Ana, had also written with a few details of her friends. She was the one who told me that they didn't have any children. God is the one who decides to give us children. We must accept that which is given to us or not without complaint, in silence and with this conviction. So, they had read Ignatius of Loyola, I knew that about them. Joaquin had mentioned Loyola in a letter he'd written. Would we speak that evening about the religious orders and their implications in the development of thought in the Middle Ages? Or, would looking at the stars in silence be enough? Without saying a single word from those read in the past. To forget the words in books, the statistics in university manuals, the interviews and reflections concerning the writing of Saints. The wine we had that evening was delicious commented the guests. Nora had already said she wanted to retire. Joaquin seemed to enjoy his conversation with me. He only made a few comments concerning Ignatius of Loyola that evening. In reality, he appeared to be more interested in Saint John of the Cross to my great surprise, as I read and reread his poetry. No, I didn´t know them. Nora and Joaquin were friends of friends. They had come up driving the almost 200 kilometers that climb from Cafayate to Cachi up Route 40 in the pick-up driven by the chauffer. It wasn´t a common occurrence to have friends or friends of friends come to visit. Really, it was indeed a very special occasion, and I was very happy when I received that letter from Joaquin in which he said that he wished to come spend a few days on my ranch. The letter implied that Joaquin was not well and that he hoped that the pure mountain air could contribute to improving his health. It appeared that he had been prostrated in bed for a period of several months. Months in which Nora would take his meals to the bed where Joaquin lay surrounded by his favorite books, among which was The Spiritual Exercises of Ignatius of Loyola. It appears that Joaquin was a spiritual man or that at least, spirituality was a subject he was interested in from an intellectual point of view. One could say of Nora and Joaquin that they were intellectuals since they were university professors. They had left Buenos Aires a few days before, and it was from there that they were making their way up North while stopping in various places. Hotels and peasant dwellings, adobe, mud, wood, stones and views of hills or low flat land and green pastures, dry grass, and gas stations. The candles on the dining room table had begun to languish. Nora had already retired to the guestroom a while ago. When there was no longer any wine in the bottle or in our glasses, we rose from the table and Joaquin excused himself and walked towards the guestroom where Nora awaited him. The coals in the fireplace were already dying but I had no desire to retire yet. One dark night, fired with love's urgent longings, ah, the sheer grace! I went out unseen, my house being now all stilled. Nora and Joaquin’s arrival had caused a certain uneasiness in me. I was used to being alone and in silence, consequently I had no desire to sleep. I decided to put on a jacket and go out to look at the stars in the night sky. I knew that it would be cold outside but that would not keep me from looking at the sky with its infinite stars. I was concerned about the motive of the trip of Ana’s friends. I didn’t quite understand why a convalescing man would undertake such a long trip making him traverse a good part of the country. And more so, why come to such an isolated place like this. It was true that my estate offered certain pleasures related to isolation. In other words, it was possible to enjoy extreme silence, behold marvelous sunsets and stars in the sky; it was also far from doctors and hospitals if they were needed. I could be but surprised that they would have chosen San Francisco del Monte as a place for rest for Joaquin. In reality, it should be a pleasure for me to host them since my life passes in such solitude. I had never married, and I had always been motivated by the contemplative life. In my property, I have a small chapel where I go in the afternoons to pray to our Lord or to the Virgin Mary. The house is big; it had belonged to my father. He had bought these lands in the thirties when he returned with my mother from a long trip to Europe. The house had been built in the forties but in the old style. That’s to say, it possesses thick adobe walls and it resembles a house from the colonial period, although it’s not from that period. The ceilings are high and made of cane and the roof is made of mud. There are verandas both in the front and in the back which allows for shade in the afternoons when the sun is too intense. Inside, the house has a strange décor with furniture from different periods. Some had belonged to my grandmother and others are contemporary with the construction of the house. I never wanted to modify the décor and there were few things that I had chosen or brought from somewhere else. For example, I liked those oversized armchairs in which my father would sit to read, or my mother to smoke a cigarette after dinner. They had a large flowered print that I presume was English. But there are also a few antiques which were in the family for several generations. The truth is I have never been much interested in decoration and so I left things as they were. I live in part of the house. I have my room and bath, and a study where I read and write letters. Milagros has her room and bath near the kitchen. She serves my meals in the dining-room or in the veranda at the back when the weather allows but the living room is rarely used unless we are numerous which only happens on rare occasions. I prefer to host in my father’s study since there are few people that visit. The study is next to the living room but it is more intimate and has its own fireplace too. The walls are lined with wood and my parents books are kept there. There are old editions of books in several languages. Next morning, I met Nora and Joaquin for breakfast at about 9 o’clock in the dining room. Milagros had lit the fireplace and it exuded a warm halo in the otherwise cold room at this time of day. The dining room led out to the veranda in the back and to a garden which lacked flowers at this time of year and looked rather sad and tired. Milagros’s husband was responsible for the upkeep of the garden but he had many other things to do so its upkeep was postponed to those rare occasions when Jose found the time to look after it. He knew a lot about horses which was indispensable because I had decided that I didn’t want to do anything except for reading and praying. I read in bed before I go to sleep. To my relief, I have my parents’ library with an innumerable number of books on the most varied subjects. It was already quite late. Nora and Joaquin slept in their room. It was at the other end of the house and from the window it was possible to see the Nevado, the mountain which presently had a layer of fresh snow. The house is silent; the shadows growing longer without a doubt. Some of the candles are surely still burning inside. Milagros has gone to bed. Some dirty glasses remain in the sink but the dishes are certainly clean and in their place in the cupboard right outside the kitchen. But what did they have to say? inquired Ana Baigorrea by mail. She wanted to know about her friends. Had they liked San Francisco del Monte? How long did they intend to stay? Did I think that Joaquin would get better? Was the mountain air good for his health? The truth is that I didn’t have a lot to tell her. Nora and Joaquin had arrived only two days before and we hadn’t seen much of each other and had spoken little until now. They spent a lot of time in their room, it appeared that Nora and Joaquin read a lot in bed. That’s where they spent most of their time. I saw them at mealtimes and for tea in the veranda. On that occasion, I spoke to my new friends of the recluse who lives near the mountain. 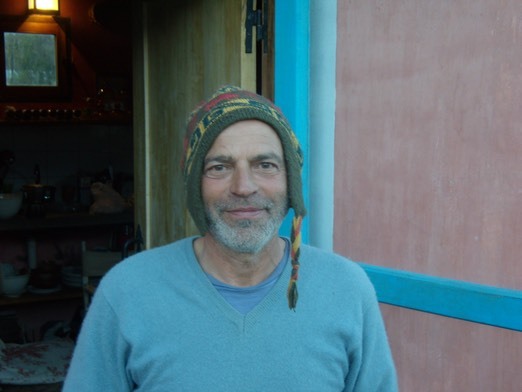 He lives in a small adobe house a few kilometers from here, at the foot of the Nevado. The local people take him provisions because apparently he’s a healer. His prayers have the quality or capacity to heal. His name is Juan and he prays almost constantly. He was already very devout as a child. He would go on pilgrimage and fast. Nora and Joaquin were very interested in meeting him. We decided we would go and see him on the following day. It was necessary to take him an offering because Joaquin wanted to ask him something very specific. He needed his help. He wanted him to pray for him. Milagros was cooking some empanadas for us to take. We left after a light lunch out of the midday sun under the veranda. Milagros’s husband was to drive us to the adobe house where he lived, close to the summit of the mountain. We started climbing up on the dirt road. The wind and the earth initiated the dance and we remained still while the dirt entered the cabin and went into my eyes. Until we arrived at the foot of the mountain of the maddening wind. Nothing mattered to me, my make-up was running but that wouldn’t stop me. My vocation or passion for spirituality had led me to conceive the ecstasy Jesus must have felt on the cross of his martyrdom. On the following day, at tea time to be precise, I had an unveiling of the conversation that my guest, Joaquin, had had with the recluse on the mountain. Where is he from? he asked. “I believe that he was born in the town of Angastaco”, I replied. “Why do you ask?” “I remembered that several months ago, I had a dream and the character in my dream was him. That’s to say; in any case he was very similar. I believed that I was dead and that I had reached the gates of Purgatory and that young man was there as well, also waiting to be admitted to Heaven. An angel asked me to move aside while he took him by the hand and led him beyond the gates to the sky. At that moment, the young man turned and looked at me while a tear ran down his cheek. The angel forcefully held his hand and led him with decisiveness beyond the gates, and they were soon lost from sight. I felt uneasy because I was left behind. I cried when I saw him walk away because he had been concerned about me; I felt that my destiny mattered to him. And, now I find him here. Yes, it was him. But last night I had another dream which was quite different than the first. I found myself at the gates of Hell trembling with fear while I heard the cries of suffering of those who were already inside. This time, the young man walked down the stairs which led to that dark and sinister antechamber, and it was he who took my hand and led me back to the exterior of that cavern towards the fresh night light of the stars where only the barking of dogs could be heard. I believe that he is indeed a healer or that he will be one for me. I need salvation, Ernestina. I think that I will die very soon” he said in a broken tone of voice, and for the first time, I understood that I had a man before me who had already been affected by death, or that perhaps was already dead or dying. And, how sad to learn this. And, to feel that reading did not bring wisdom and that this man was preparing to die as he could. He resembled a child whose toys are taken away and suddenly remains with an open mouth without response. “You must continue to pray, my friend” I said somewhat confused. “Praying is the way” and I squeezed his arm when I said this. “Oh, so that’s it! You’ve come to die at the foot of the mountain? But, that’s an appalling dream when it’s so easy to die anywhere. And, what exactly is the nature of the illness? To die there must be a cause. What is the cause in this case?” “Sorry, interrupted Nora. We don’t intend involving you in Joaquin’s death. It’s a very personal matter. We know that. But, I thought that Ana may have written to you about our pilgrimage to this mountain. It’s named differently, at least in a dream I have divined another meaning. The ‘Nevado’, that’s not its real name”. I walked away from those two silhouettes that in the evening began to disappear. It was that precise time of day in which the day begins to die, it renders its light; it slides in between the arms of darkness. To speak of the death of Joaquin, of his eminent departure did not have to scare me at all. My parents were already gone; they had been buried here at San Francisco. Earth would embrace another silent body; accept as its son that child who desired to obtain the sky. But in order for that to be, it was necessary to pray with an open heart and an audacious and clear mind. It hurt me; it hurt me to see a man with fear. Where is his heart? Afraid of death? Me, never! The recluse had promised Joaquin that he would pray for him for the next few days or even weeks, in other words, he would pray as long as was needed for him to recover his health. Joaquin was more interested in dying, or at least in languishing. Now, his wife was entirely dedicated to him and he lived inside a bed which was a warm and comfortable place. It was even rare to see him at mealtimes when we sat in the veranda and Milagros brought us lunch or tea. In the evenings, we always had our dinner indoors in the dining room with its lit fireplace. I sometimes ask myself, how long do my guests intend to stay because quite frankly, I didn’t owe them anything. But somehow we had found the way to be together. The house was so big for me alone and yet I was so used to my solitude, but to have this couple of strangers in the house was nonetheless agreeable. Besides, it allowed me to put into practice my compassion and frankly, Joaquin was agreeable to me, although his state could be described as melancholic. What was important was that he had found consolation in the recluse. That young man surely had an undeniable gift and was already admired and loved by the locals. Slowly, his fame grew and people were beginning to come to see him from Salta, from Seclantas and Molinos. I was pleased to know that I could be of help and contribute to healing an important scholar such as Joaquin, whose writing was consulted by historians. I had gone to search for the glasses and bottle of whisky. Milagros was in the kitchen preparing dinner. I asked her to bring a bucket of ice to the table and walked back to the veranda with the bottle and glasses. It was already getting dark and once the sun hides behind the hills, the cold night descends from the mountain. We returned to the house and sat in my father’s study. Milagros’ husband lit the fireplace while I poured the whisky into the glasses and Milagros came with the ice. I loved that room that I had never allowed myself to change or to remove any objects from. The room remained just as it was when my father lived. I was glad that it was so; it was a way to have him close. Well, now I do want you to tell me everything. You’ve been here for several days and have chosen to remain in your room. We have spoken about history, the history of the Calchaqui Valleys. We have spoken about the weather, whether it’s cold, whether it’s warm. We already know that there exists a large variation in temperature between day and night. This is a high altitude desert. We have also spoken about lineages, of this or that family, like my own who owns lands here. But now I want it all out. Why do you presume that Joaquin is going to die soon and for what reason? “Joaquin has a terminal illness, Ernestina. It’s cancer which advances over other organs. His doctor has said that he cannot do anything for him. We think that he will die within the next few weeks”. Joaquin interrupted Nora, “It appears that it’s an incurable disease. He advised me to go away. He said that the mountain air could be good for me, that in any case, a spiritual retreat would be of consolation. That’s why I ‘m here. If I spend my days in bed it’s because I feel tired”. “It doesn’t bother me that you spend your days in bed, Joaquin. I truly feel honored; that you should have chosen this place for such a solemn event. And, if I may accompany you and be of some use…” “We are very thankful” said Nora. “Thank you, truly”, said Joaquin. Days passed, the mornings were cold and the afternoons warm. Towards the end of day, Joaquin sat on a chair in the back veranda. He almost resembled my father I thought one afternoon in which he surprised me sitting there in the silence of the evening without end. All men resemble each other. They are much weaker than the women who have learned to be brave. It really doesn’t matter. Joaquin could be a woman in the body of a man, he could be a dog in the body of a man, I think. Who truly knows whether he’s a man or a woman, inside his body. God says we are souls. In heaven or in hell, does our soul have a gender? No, I don’t think so. Then, we are neither man nor woman. Only for an instant while we traverse this reality.